Fenda Audio has added two new 2.1 wireless Bluetooth speakers to its range of speakers in India - the W330BT and W130BT. Established in 2004, Fenda has been dedicated to bringing a quality sound experience to the Indian market. Its brand F&D, under which it markets its multimedia and laptop speakers and docking stations, has since grown into offering more than 30 products, which are today available at all major electronic stores and dealer locations across India. The two new wireless Bluetooth speakers are built on the CSR (Cambridge Silicon Radio) chipset, and bear the tag of an SIG certification. 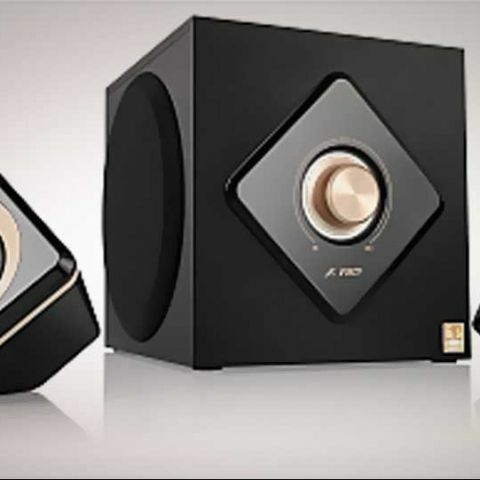 The Fenda Audio W330 has a unique cubic design and golden rings at its centre. It also packs along a super volume knob and a white LED ring with treble and bass control coming on the side panel. The W130, on the other hand has a heavy-duty look with a solid metal grill. Both the W130 and W330 are compatible with iPhones, iPods, iPads as well as Samsung Galaxy and HTC phones besides other Bluetooth devices. The products W330BT and W130BT are priced at Rs. 5,990 & Rs. 3,990 respectively. best bass oriented 2.1 speakers in 3.5 thousand to 4 thousand?